Beau's Bio... and more than you ever wanted to know about Groundhog Day! Around the fifth century, the European Celts believed that animals had certain "supernatural" powers on special days that were half-way between the Winter Equinox and Spring Solstice (forty days after Christmas and forty days before Easter). Folklore from Germany and France indicated that when groundhogs and bears came out of their winter dens too early, they were frightened by their shadow and retreated back inside for four to six weeks. When Christianity came into being, the formerly pagan observance was called "Candlemas Day." In America, Candlemas Day became "Groundhog Day" to singularly honor the whiskery waddler. The current tradition calls for "Spring Just Around the Corner" if the groundhog does not see his shadow. 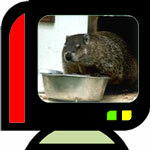 However, look for "At Least Six More Weeks of Winter" if the groundhog spies his pudgy image! Many years ago, the staff of The Yellow River Game Ranch noticed that General Lee did, indeed, emerge on Groundhog Day; and we decided to start watching him a bit more closely since we felt Atlanta represented the weather for the entire Southeast. "Beau," as his intimates refer to him, works only on February 2nd and worldwide media attention follows his every amble. "Groundhog Hotlines," located only a few feet away from Beau's Weathering Heights Plantation, open for advisories at 6:00 am EST, and calls come in from as far away as Germany, England and even the sunny State of Hawaii. Beau has been recognized for his public service to Americans by four Georgia Governors; and has twice been commended for the accuracy of his predictions by The National Weather Service. He has received honorary doctorates from The University of Georgia – "DWP, Doctor of Weather Prognostication" and Georgia State University – "Doctor of Southern Groundology." Beau appeared on "The Today Show" with Willard Scott during The Democratic Convention in 1988. He answers his own mail (no form letters) with a complimentary V.I.G. (Very Important Groundhog) Photo on a year-round basis. In 2004, Beau was featured on Animal Planet on Feb. 2nd. Unlike the unnamed woodchuck up North, General Lee's plans vary every February 2nd. The V.I.P. announcing the annual prediction has ranged from actor Keith Carradine to the very "neutral" Swiss Consul. The musician who plays Reveille is also different and several branches of the military service have woken the General, as well as musicians from leading universities. The aromatic Southern food placed on Beau's verandah also changes from year to year. A lavish addition to Beau's white-columned Southern mansion is another major surprise. He owns an architectural water fountain; a postal box; a granite monument; a monogrammed lawn marker, sundial, doormat and a satellite dish that allows him to watch PBS nature specials. He has further enjoyed a broad jump and high diving board which readied him for The Olympics. It is alleged that Beau’s Official Mansion also includes a laptop computer for his prodigious correspondence and a Wine Cellar to recover from the labors of His National Holiday. Groundhogs are classed as mammals. Their order is Rodentia. They primarily eat healthy vegetables and salad items. They are nocturnal, sociable and "chatter" to those they know in fluent "groundhogese." While groundhogs in the wild live only to about four years old, Beau's lavish yet healthy lifestyle at The Game Ranch has extended his years. The first General Lee, "in service" for ten years, is now retired and lives in seclusion at The Game Ranch. Beauregard is his fifteen-year-old bachelor nephew and has inherited his wealth and brilliant prognosticating skills. Beau emerges when he wishes to on February 2nd; and Game Ranch staff never knows in advance what his prediction will be. "Only The Beau Knows." General Lee retains his own Public Relations Counsel. Further information may be obtained, upon polite request, by calling 770-972-6643. Beau is also featured on the website – yellowrivergameranch.com. General Lee resides at The Yellow River Game Ranch along with six hundred other animals and birds indigenous to Georgia. The 24 acre people-friendly animal preserve is open seven days a week; and is located just 2 1/2 miles past Stone Mountain on Highway 78 East, in Gwinnett County.